Mordechai “Bilshan” ben Yair (c. 5th century BCE) was a Jewish official in the court of the Persian King Xerxes (Ahashverosh). He raised his orphan cousin Esther, who subsequently became the queen of Persia. Mordechai famously refused to bow down to the evil genocidal minister Haman, who sought to deify himself as a god. Thanks to Mordechai’s previous foiling of a plot to overthrow the king, Haman was unable to take revenge on him. Instead, Haman himself was hanged on the gallows he had made for Mordechai, and Haman’s plot to exterminate the Jews was averted. Mordechai was elected to replace Haman as minister. 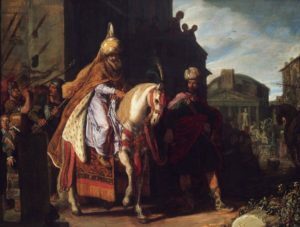 He and Esther instituted the holiday of Purim to commemorate the miraculous victory, and wrote its history in the Scroll of Esther. (Establishing a new holiday was no easy feat, and was one of the great debates of its day, with significant implications for the future of Judaism.) The Talmud states that Mordechai was a prophet, and ultimately returned to Israel, helping to rebuild the Temple in Jerusalem and re-establish Jewish life in the Holy Land following the Babylonian Captivity. He is sometimes identified with the prophet Malachi, and is called “Bilshan” because he was a ba’al lashon, a speaker of many languages (seventy languages, according to several sources). He ended his life as a member of the Knesset haGedolah, the Great Assembly which composed the first formal texts of Jewish prayer and compiled the Holy Scriptures to produce the first official Tanakh. Happy Purim! The people which faithfully honoured for 2500 years the oath sworn by the Rivers of Babylon not to forget Jerusalem – this people will never reconcile itself with separation from Jerusalem… For the State of Israel there has always been, and always will be, one capital only – Jerusalem the eternal. This entry was posted in Law, Politics & Military, Religious Leaders and tagged Ahaseurus, Ahashverosh, Babylonian Captivity, Esther, Great Assembly, Haman, Holidays, Knesset haGedolah, Malachi, Mordechai, Mordechai Bilshan, Persia, Persian Jews, Purim, Tanakh, Xerxes on February 28, 2018 by Jew of the Week.